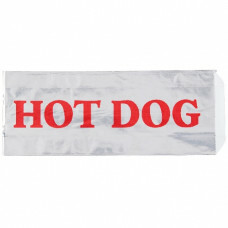 These Foil Hot Dog Bags Are ideal for packaging and holding cooked hotdogs. Pre-package your hotdogs in these bags and put in a warmer for fast serving. Each bag is 3-1/2" x 1-1/2" x 8-3/4" and will hold a standard length hotdog. Packaged 1000 bags per case.